Richard Lopata (l) and Alex Alvarado. Photos: Bart van Overbeeke. Richard Lopata and Alex Alvarado are both recipients of a Starting Grant from the European Research Council. 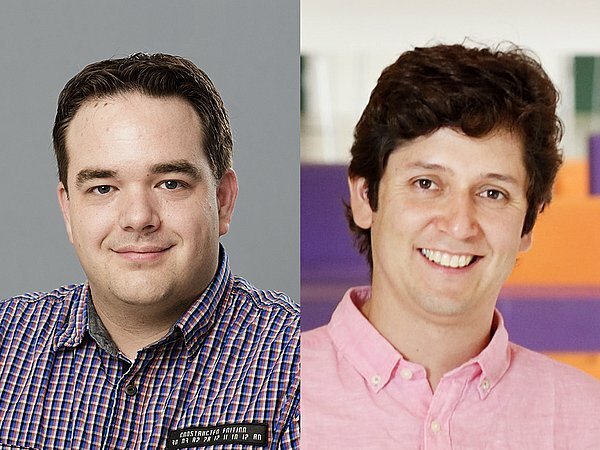 Lopata will use his grant to work on new medical imaging techniques based on a multiperspective ultrasound scanner for improved diagnosis of certain cardiovascular symptoms, while Alvarado will focus his attentions on increasing the current maximum data capacity of optical fiber, that will soon become insufficient. Lopata will develop fundamental techniques to combine the images from two ultrasound probes, taken from different parts of the body. The primary goal is to help doctors better understand the rupturing of aneurysms and predict heart failure. Doctors are increasingly keen to inspect the human body to find out what is wrong, Lopata explains, for instance as a regular check. But MRI and CT scans are very expensive and the latter exposes the patient to a lot of radiation. Imaging using an ultrasound scanner is both cheap and patient-friendly by contrast. The drawback of ultrasound is that only a very small part of the body can be seen and the image is not always as sharply defined in every direction. Lopata wants to remove these limitations by using two connected 3D transducers. The problem that he has to solve here is that the sound produced in different kinds of tissue varies in terms of velocity and reflection, which makes it all very tricky to combine. Next, he will also be developing a technique whereby the dual ultrasound probe generates a profile of how the heart muscle stretches. Since the contraction is indicative of the health of the heart, this could be a good, early stage predictor of heart failure. The third target of Lopata’s research is to try to visualize the elasticity of aneurysms – bulges in the abdominal arteries. There are indications that the rigidity of the aneurysm wall is a predictor of growth or even tearing, which is often fatal. Many patients are currently operated on as a precaution once the diameter of the abdominal artery exceeds 5.5 cm. However, in many cases this is actually not necessary. Lopata hopes to develop an inexpensive technique to monitor people with an aneurysm and thus prevent unnecessary treatment or premature rupture. Most of the data communicated around the world is transported by optical fibers. Although the capacity of these fibers is huge, limits are being reached due to the ever-growing use of data. So more capacity is needed to send more data, which in turn requires additional optical power. When the optical power that runs through the fibers exceeds a certain amount, the data traffic becomes disrupted as the light refraction index of the material changes. This is known as the Kerr effect. The light in the fiber starts to behave in a nonlinear fashion, disturbing the signal and the equipment that can no longer properly process the data. The current solution is keeping the power below this power limit and has prompted a lot of R&D effort worldwide to develop measures that avoid nonlinearity. Alex Alvarado suggests a different approach: he wants to fundamentally understand how light in optical fibers behaves in the nonlinear regime. “We should not regard non-linearity as a limitation, but embrace it, and use it to send even more data,” Alvarado contends. He believes that the amount of data that can be sent by optical fibers can be doubled. However, it will not be easy because it is not just the Kerr effect that presents problems in sending high-capacity data traffic over great distances. Light signals also stretch over great distances and this can cause them to overlap (due to dispersion). And more and more interference creeps in due to the frequent need to strengthen the signal on route. The knowledge that Alvarado’s project will produce could save a lot of money since fewer long-distance cables will have to be laid, on land and on the ocean floor. His work should enable the design of new optical transceivers that are able to cope with nonlinearity. Lopata will receive 2 million euros from the ERC for his study while Alvarado will receive 1.5 million. The ERC Starting Grants are aimed at top scientific talent in Europe who obtained their PhDs no longer than seven years before. These grants are highly esteemed: the ERC received around three thousand applications this year but was only able to honor 406. Last week the ERC announced this year’s laureates.